“One downside of increased mass political activism is all the loudspeakers. There are few noises more grating than an elderly megaphone hectoring out some battle cry, chanted back by croaky crowds. On repeat, for hours, it can get a bit wearying. Here’s where musicians ought to come in. The protests of the past were often soundtracked by song. 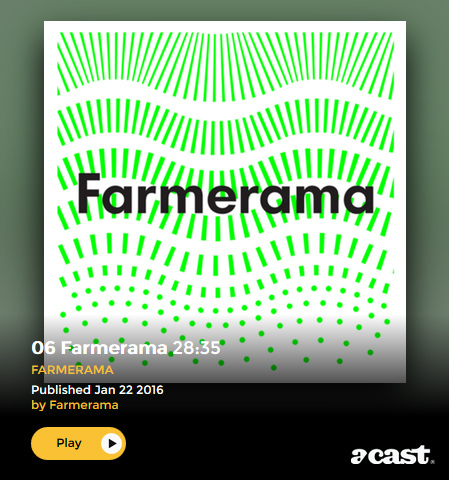 Not just any old tunes, but brilliantly inventive ballads and broadsides, like some of those I heard last Friday at a folk history of land rights called Three Acres and a Cow. This included ditties such as Ewan MacColl’s The Manchester Rambler, dreamed up in 1932 to commemorate the Derbyshire mass trespass – and so fantastically catchy I’d somehow retained it from when I traipsed up Kinder Scout on a 60th anniversary walk in 1992. This entry was posted in Scrapbook and tagged catherine shoard, first time, mention, newspaper on February 22, 2017 by cow. Leo Tolstoy short story – How much land does a man need? An elder sister came to visit her younger sister in the country. how she went to the theatre, promenades, and entertainments. tradesman, and stood up for that of a peasant. safer. Though a peasant’s life is not a fat one, it is a long one. “Enough? Yes, if you like to share with the pigs and the calves! and he listened to the women’s chatter. cleared away the tea-things and lay down to sleep. land he would not fear the Devil himself. always had to pay a fine. for it. When the peasants heard this they were very much alarmed. agreed to this plan as she had to the other. wait a year for the other half. Pahom felt envious. get none of it.” So he spoke to his wife. brother-in-law, and so scraped together half the purchase money. that bloomed there, seemed to him unlike any that grew elsewhere. as any other land, but now it seemed quite different. “I cannot go on overlooking it, or they will destroy all I have. thought Pahom, “but the rascal has actually cut down a whole clump. land, his place in the Commune was much worse than before. freehold land as he wanted. spring, and then started with his family for the new settlement. of cattle as he liked. The question of buying freehold land recurred to him again and again. it, and things fell out so that the labor was all lost. tea, some wine, and other presents, as the tradesman had advised. covered tents. They neither tilled the ground, nor ate bread. eating mutton, and playing on their pipes, was all they cared about. Russian, but were good-natured enough. themselves, and then told the interpreter to translate. saw that they were much amused, and that they shouted and laughed. need to wait for his return. “And what will be the price?” asked Pahom. “But in a day you can get round a large tract of land,” he said. start from that spot and make your round, taking a spade with you. Pahom was delighted. It-was decided to start early next morning. some more mutton, they had tea again, and then the night came on. daybreak and ride out before sunrise to the appointed spot. Pahom lay awake all night, and dozed off only just before dawn. that the man was dead, and that it was himself! He awoke horror-struck. “What things one does dream,” thought he. Looking round he saw through the open door that the dawn was breaking. harness; and went to call the Bashkirs. “It’s time to go to the steppe to measure the land,” he said. “If we are to go, let us go. It is high time,” said he. “See,” said he, “all this, as far as your eye can reach, is ours. different kinds of grasses grew breast high. “This will be the mark. Start from here, and return here again. some moments which way he had better go–it was tempting everywhere. the sun to appear above the rim. carrying the spade over his shoulder, went down into the steppe. while he dug another hole. warm now; he looked at the sun, it was time to think of breakfast. soon yet to turn. But I will just take off my boots,” said he to himself. He sat down, took off his boots, stuck them into his girdle, and went on. It was easy walking now. ants, and he could just see something glistening there in the sun. untied his flask, had a drink, and then turned sharply to the left. He went on and on; the grass was high, and it was very hot. Pahom began to grow tired: he looked at the sun and saw that it was noon. haze the people on the hillock could scarcely be seen. square. He was still ten miles from the goal. So Pahom hurriedly dug a hole, and turned straight towards the hillock. for no man, and it was sinking lower and lower. only the spade which he used as a support. should die of the strain. gathered his last strength and ran on. that blood was flowing from his mouth. Pahom was dead! The Bashkirs clicked their tongues to show their pity. his heels was all he needed. 2. A non-intoxicating drink usually made from rye-malt and rye-flour. to sleep in a warm place. this story round numbers are used. This entry was posted in Scrapbook and tagged greed, land, ownership, russian, short, story on January 23, 2017 by cow. 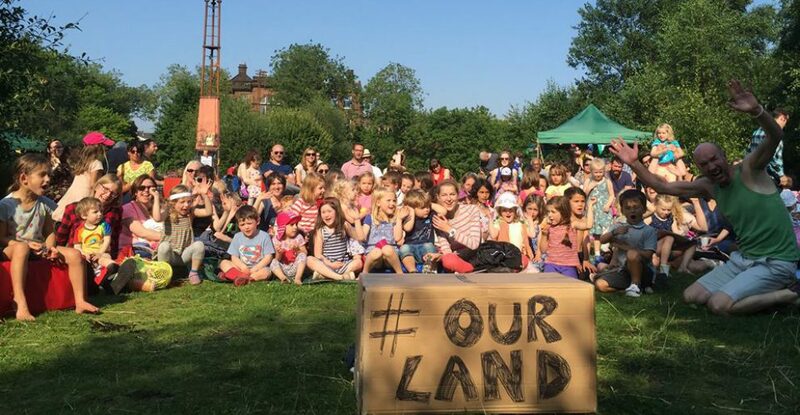 This entry was posted in Scrapbook and tagged #ourland, Community, development, glasgow, land, saved, Scotland, wood on January 11, 2017 by cow. I recently had this correspondence with Alistair who saw the show in Norham, Northumberland last month back. He gave us permission to post our exchanges online which I wanted to do as they made me cry (in a good way). Good performance. Thank you for coming to Norham. Tweed Valley is a conservative area, and your message is revisionist of establishment posturing, so I wonder if you got a positive reaction? Seems like Marion Shoard is a gatekeeper person: if she was for you, who could be against you! It was an interesting evening for us, in lots of ways. We saw the ad for your show in Berwick High Street, but we live three miles north of Norham, across the border into Scotland at Horndean, the next settlement beyond Ronnie, your guest singer, who lives at the first settlement north of Norham Brig and over the border, at Ladykirk. Interesting for me. When I worked in agricriculture as a farm worker, I was a NUAAW rep and had training at Southend where I bought ‘The Painful Plough’ way back then. That was 1975. Interesting for me because I studied at Oxford University Institute of Agricultural Economics 1969-72. In those days, the Common Agricultural Policy was at an early stage, and was seen as a device to 1. Protect the small acreage farmers of France by holding up prices with subsidies and 2. Reducing the European tendency to overproduction with quotas for each commodity and 3. Withdrawing produce from the marketplace into storage when there was overproduction e.g. the grain mountain. 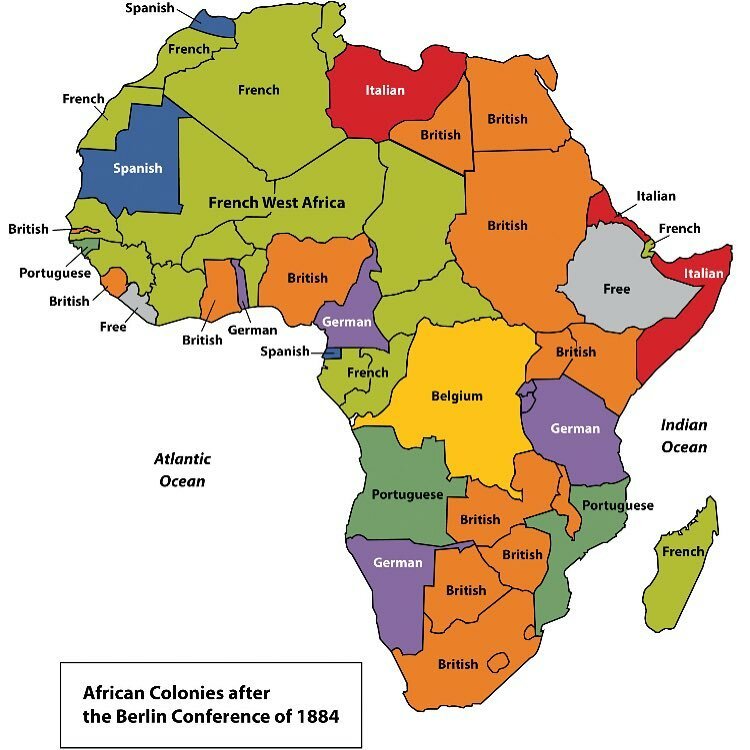 In those early days it was seen as adverse to British Interests. I’ve been away from agriculture for years now, apart from a family farm extended family owns, and I haven’t really followed the single farm payment developments closely, so I was really interested in your summary, and in the views of the Welsh farmers you have spent time with, and I do not doubt, knowing the general mindset of the preset Westminster elite, that the direction is to consolidate into larger land units that then become attractive to fund managers and insurance interests, and cease to produce food as their prime concern. Interesting for me because I am quite close to the Scottish Greens, and have followed Andy Wightman’s work in recent time. Following your exposition, I will look more closely at his site. Interesting for me because we ramble, and have enjoyed the Right to Roam in Scotland, which as I have understood it permits access onto all PRIVATE open spaces unless and until the landowner requests that you leave the site for a genuine and defensible reason e.g. timid or frightable stock. Your summary of the Right suggested it referred to PUBLIC open spaces, which are surely not 80% of Northumberland? Clarification needed for me here. In general your narrative was well supported by facts, and was not long on opinions, which made it enjoyable, as one could think, and buy in with one’s own conclusions. Too many facts, too fast, can become a barrage, and the mind closes, hence of course the value of your songs. Anyhow, in general you got it right. At the end, saturated with impressions, we needed a more stark arrival point i.e. the Land Reform groups names and logos appearing on your string line. Anyhow, I really mustn’t criticise your content, as it was original (in its collected form), and superbly researched and presented. You are both immensely multi-talented, and I will certainly do my best to commend your presentation to contacts wherever you go. What you are doing is most worthwhile – to rightly judge the English and other UK countries, and Eire, in our past internal struggles, and in our past overseas activities, is a proper road to understanding ourselves and our place in the world today. For me you did not put a foot wrong, and my over-riding reflection is your positivism – you were not embittered as many revisionists are, or grinding axes at us, which is the angry face of revolution. You were, I think, true revolutionaries, seeking sound values for yourselves and offering them as tenets of worth to those willing to accept them. That is a most civilised and companionable modus vivendi, and I am sure it will win you many friends. So, I thank you for your cultural contribution of “Three Acres and a Cow”. Thanks so much for your letter – it was a delight to receive. So good to get feedback from someone with a depth of knowledge on the topic. We got a good reaction from the people we talked too… As it was our third day on the road and I was knackered, I prioritised singing songs with the people who had traveled a long way and missed some of the first half, rather than trying to gather as much feedback as I could have. The messages in our guest book were positive. Ronnie, Gail and Joan enjoyed the evening hugely and as most of the audience were known to them, I am sure that they will collect more reactions and feedback in the coming weeks. The show has been performed to conservative audiences in the past, but not in such a rural area. I must confess to being quite nervous about this, but am growing in confidence now due to the feedback from so many people from extremely differing backgrounds over the years. I also know that the Norham area has traditionally elected Liberal MPs, and that land reform has historically always been a cornerstone of Liberal policy. You will be glad to know that Marion Shoard and I have been in conversation and are about to start exploring making podcasts and radio shows together. She is very happy to hear that people are talking about land again and that more singing is involved this time around! I also encouraged her to get a wikipedia page which she has – https://en.wikipedia.org/wiki/Marion_Shoard. I am so glad to hear that you know of Roy Palmers book ‘The Painful Plough’… His work has been a huge source of information and inspiration over the years, and I was incredibly lucky to have him mentoring me and sending unpublished ballads he’d collected, the last few years of his life. Sadly, he does not have a wikipedia page and I am yet to work out how I can make this happen, as his contribution to English culture has been huge and largely unrecognised outside of certain niche circles. Our statistics on Northumberland rambling %’s is taken from the Ramblers Association factsheet ‘The Right to Roam’ which can be found here – http://www.ramblers.org.uk/~/media/Files/Go%20walking/AccessFactSheet-FS8.pdf – It states in a table on the 2nd page that the amount of publicly accessible open land in Northumberland went from 19% to 85% in 2003 and I trust them on these figures. Please do let me know if you interpret this differently. Thanks for your thoughts on the pacing and balance of the piece – a conscious effort has been made to keep opinions to a minimum and deliver it in as gentle and fun way as possible, allowing people to make their own conclusions. There are a few topics where I do offer my own opinion sometimes and I am glad you think we get the balance largely right. The ending – ha… if there was anything resembling an English land reform movement we would indeed be signposting people to it! but there isn’t really yet… we are trying to support one into being under the rubric of ‘Land for What?’ but alas are a long long long way behind Scotland – http://landforwhat.org.uk/. 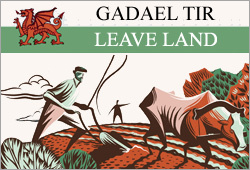 I usually mention the Landworkers’ Alliance and Ecological Land Coop (and their names are on the line) who are doing ground work to challenge the status quo around land but I was super tired and did not talk about them at the Norham show you saw. Your last paragraph or two were very nourishing, thank you. At times, it can be a long and lonely road that we’ve been walking and if you’ll forgive me mixing metaphors, words such as yours give wind to our sails. Appreciate your full response to my letter, thanks. What you say about the origins of the CAP does ring true to my understandings. I spent time in Germany in the early seventies, as secretary of the United Kingdom and Ireland Agricultural Students Association, representing UK at the 15th International Agricultural Association of Students at Stuttgart and Kiel, and also in a hosted group of international ambassadors for change allied to a group called MRA, visiting the Ruhr industrial area which had been the scene of much conflict. There was still a vast dammed reservoir of guilt in Germany about the events of the thirties and forties, and it drove much of what they were doing at that time. Also, I note that my confusion about the Right to Roam in Northumberland is entirely cleared up by your reference to source material. Like yourself, I have down the years been at first surprised, and then more often scandalised, by revelations about “Great Britain’s” past. We have had an extraordinarily selfish and cruel ruling class, possibly from the Norman Conquest onwards, as your overview suggested. My own clan were Highlands and Islands folk in the C17th, C18th and C19th centuries, and were forced by a combination of malicious social forces to emigrate to the Southern States (where there is a Clan Reunion for 350 of them each year now) to Canada where one of my great, great grandfathers was born in Nova Scotia (and your description of the ships which took them there was spine chilling), and to South Africa, and to Australia where John MacKichan blew himself up at Lobo whilst clearing land with dynamite. The decision to move to lands of opportunity was driven not by ambition, but by desperation, and the terrible injury inflicted on the aboriginal native peoples as a result is a crime by proxy by those who forced the emigrations. The sharp thrust of your delivery in Three Acres and a Cow is that there are areas of the world in which the UK establishment, and you were not specific, is still connected to genocidal activity. That was a telling insight about the repetition of learnt behaviour, and it should arouse indignation among our people to think that the worst we have known is now being dealt, perhaps in our name, to others. Your summary on Ireland named one Englishman viewing the Irish potato famine as “An Act of God”. I have read that there was stored grain available in England, and that it was indeed promised to the desperate Irish, but then deliberately withheld, which corroborates your judgement of genocide of a million Irish who died in those years. There is a loch in Ireland where a wandering, starving band inscribed their heart feelings on a stone – I have visited it and seen it but do not remember detail, except to note that it is most moving. The Gaels are a different race, driven in early centuries AD to the “Celtic Rim”, and in culture and values see themselves as different from the English. That is not a antagonistic difference, but a dignified ontology and identity. You will have felt it in your time in Wales, and for what it is worth, in my own performing days I sang a national celebration in Welsh in Bangor Cathedral, “Ee gumree ganav. uist tervisk dwicht a don” (phonetic spelling now – a distant memory) and I felt the rose and bloom of the Welsh culture then. For the self-interested English to exploit, and to dishonour, other racial groups than their own seems to have been a terrible and constant theme of history. This inter-necine animosity strays from your main points of Land Rights and food security, but they are strongly linked in our history. One of my clansmen, starving, was imprisoned for the act of stealing one turnip, from the owner of a field he had toiled in all day, in an attempt to feed his family. That harshness was imposed not by the native clan system, but by the annexing of lands after 1745 by a vindictive English oppression. The tales go on. All power to you, always find the performer’s balance between intensive output and gentle restoration! This entry was posted in Scrapbook and tagged CAP, EU, family tree, feedback, germany, history, Ireland, learning, living history, Scotland, Wales, witness on November 15, 2016 by cow. 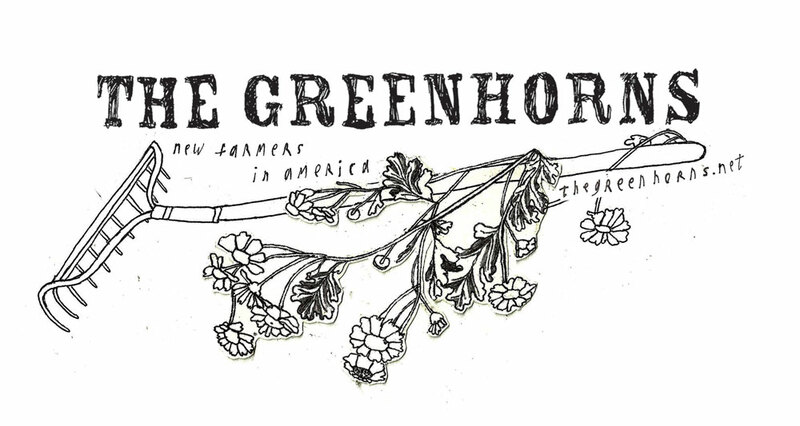 Last week Robin was interviewed on Greenhorns Radio by Severine Von Tscharner Fleming about music, land rights, Three Acres And A Cow and the upcoming Land for What? weekend. This entry was posted in Radio/Podcasts and tagged folk, greenhorns, heritage radio, land, land rights, music, radio, Severine Von Tscharner Fleming on October 11, 2016 by cow. 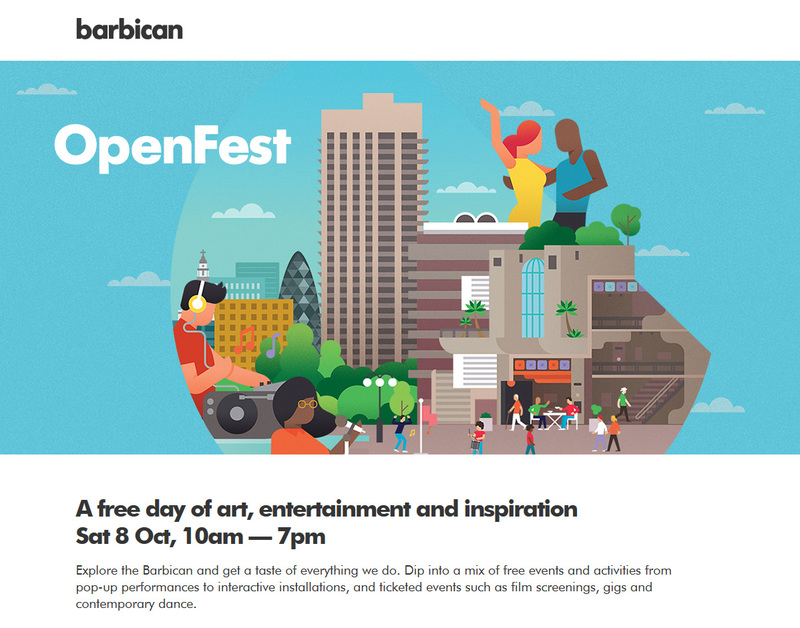 OpenFest is an all day free festival at the Barbican Centre. This entry was posted in Shows and tagged Barbican, folk, Free event, London, music, poetry, Rachel Rose Reid, Robin Grey, song on September 21, 2016 by cow. 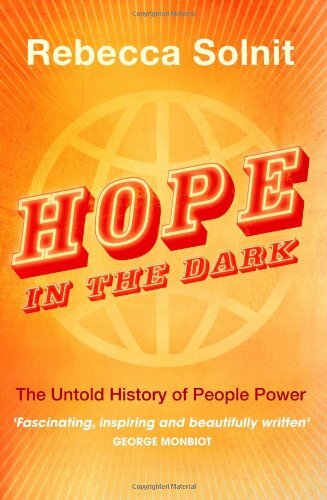 I have yet to read this book but have it on authority that it will blow my socks off so I thought I might take the step of telling you all about it asap as my backlog of books is somewhat chronic as of late! This entry was posted in Books and tagged book, history, human rights, inspiration, land, read, stuggles on August 5, 2016 by cow. This entry was posted in Scrapbook and tagged Community, land owner, land reform, Land Reform Act, Scotland, Scottish on June 26, 2016 by cow. “The (Syrian) Government had been pursuing a policy of agricultural intensification and economic liberalisation, based on the expansion of irrigated crops for export such as wheat and cotton that were reliant on chemical fertilisers. The chemical inputs and monocultural cropping contributed to the degradation of Syria’s soils, while poor irrigation infrastructure led to salinization, particularly in areas such as the Euphrates. And with the Government’s decision to cut subsidies to fertiliser, diesel, pesticides and seeds in the 2000s, many small-scale farmers could no longer afford the inputs on which their crops had come to depend. That particular tale is all too familiar in all too many countries – and there are many experts in the world of mainstream agribusiness who are still keen to do exactly the same across the whole of Africa, regardless of the vast weight of evidence we now have as to the calamitous consequences of that process of intensification. The calamity in Syria could not be starker, with 80% of the remaining population facing dire poverty, with sky-rocketing food prices, and with all factions involved in the conflict using ‘food as a weapon’ to secure their military objectives. This entry was posted in Scrapbook and tagged agribusiness, commons, drought, intensification, monocropping, monoculture, over grazing, syria, war on June 19, 2016 by cow. 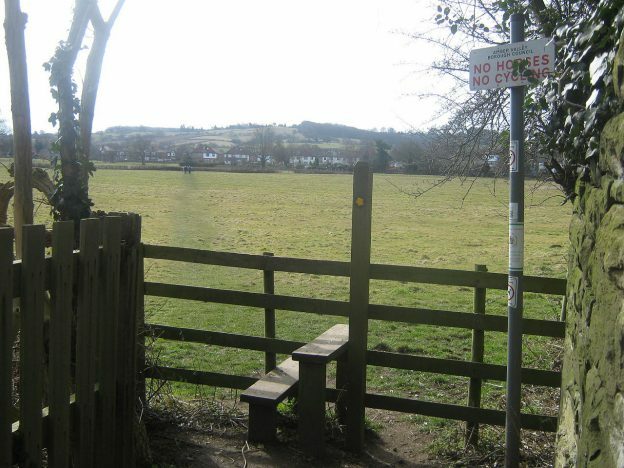 This entry was posted in 2000's, Scrapbook and tagged 2026, bridleways, footpath, forever, lost, paths, rambler, registered, walking on June 13, 2016 by cow. 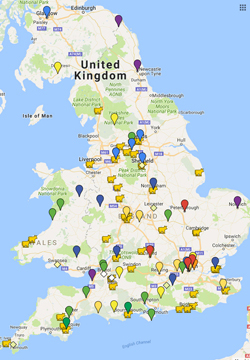 David Cameron has said that he sees the purpose of these CAP payments to ‘rationalise the agriculture sector’… which means ‘to put small scale, family farmers and anyone who cares about soil and the environment out of business’ in politics speak. This entry was posted in Scrapbook and tagged CAP, common agricultural policy, England, land subsidies, single farm payment, socialism for the rich, uk on May 13, 2016 by cow. This entry was posted in Scrapbook and tagged dirty money, housing prices, investment, land prices, land priceshousing prices, offshore, private eye, property industry, tax havens, uk on April 5, 2016 by cow. “There is a strong case for fundamental changes in the way land is taxed, controlled and used. The speculative profits arising from owning desirable land need to be either taxed or captured by local or national governments — or perhaps communities — by owning the land themselves. In many East Asian countries, such as South Korea, Hong Kong and Singapore, the majority of land is controlled by state corporations — public ‘land banks’. In the US and Canada, there are similar schemes at state or local government level. This entry was posted in Scrapbook and tagged banks, far east, germany, land, land banks, land value tax, singapore, taxation on February 17, 2016 by cow. We’ve had a number of people ask us when we are going to get some of the show on youtube… Well the answer is now! Hurray for time lapse photography… it makes the show flow really nicely we think. This entry was posted in Scrapbook and tagged JW3, lights, lightsmusic, music, naomi wilkins, performance, Rachel Rose Reid, Robin Grey, stage, time lapse on February 15, 2016 by cow.